We love motorcycles and would never leave a bike or a biker stranded. Most of our fleet consists of flatbed roll off carriers, this allows us to help you faster and more efficiently than our competitors. There are still many towing companies in the Lansing area that only have one flatbed roll off carrier in their fleet. Our drivers understand how to secure your bike and will treat it as if it was their own. Do not get stuck waiting! We use direct line powered cables from our recovery vehicles, reducing jump times. We love to see your face after we pop the door open and get you back in your car. It happens - In the United States around 800,000 drivers per year will run out of gas. 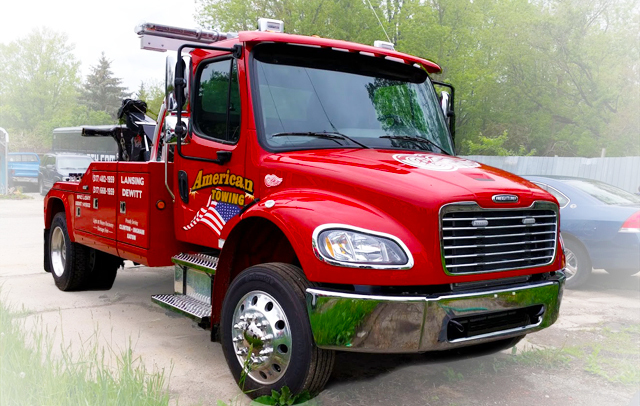 Let American Towing change your flat tire while you stay out of harm's way.